Located in Ottawa, ON, Lansdowne Park is a world-class attraction that blends modern amenities, courtyards, heritage buildings and green space. Lansdowne Park won the Ottawa Urban Design Award of Excellence – Visions & Master Plans and the 2016 CSLA Jury’s Award of Excellence and National Award. The park features a Great Lawn, an urban square for the Ottawa Farmers’ Market, a series of grand alleys, plazas, intimate greens, civic gardens, orchards, a children’s play zone, a water plaza, and public art. The Aberdeen Pavilion remains the great ‘tent’ at the centre of the park for indoor programming, and adaptive reuse of the Horticulture Building includes a teaching kitchen and community hall. All spaces have been considered as flexible venues for everyday enjoyment as well as for year-round special events programs, returning the park to its rich continuum of exhibition, display, and recreation. 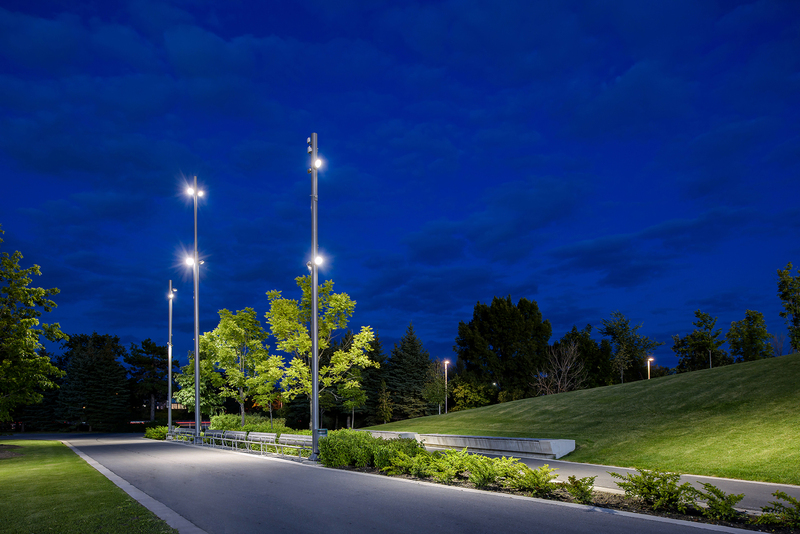 The public realm lighting compliments the landscape while providing both general and flexible event lighting throughout the park.